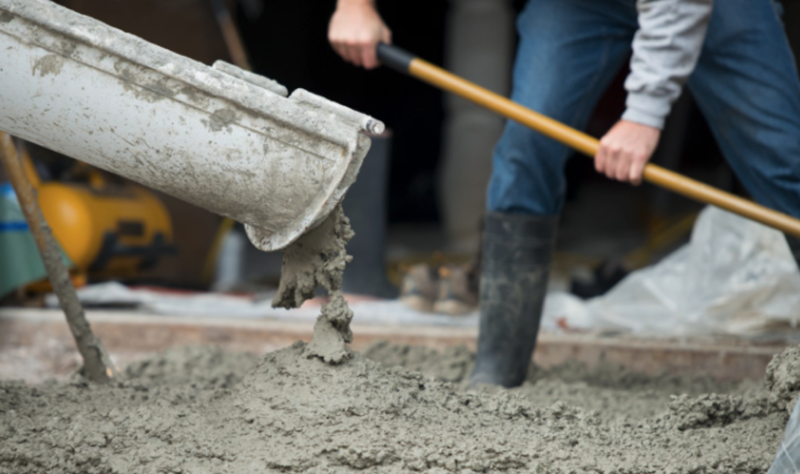 PLACING: Synthetic, steel, and blended fiber reinforced concrete can be placed using conventional methods such as concrete chutes, buckets, conveyors, and pumps. Whereas, Fiber Reinforced Shotcrete (FRS) can be placed using standard shotcrete equipment. WORKABILITY: The slump of concrete is NOT an indicator of workability. Instead, the slump is used to measure the consistency of the concrete from load to load. A correctly proportioned FRC mix will have excellent workability properties. The concrete can become very fluid with the use of vibration. The addition of fiber increases the surface area in the concrete matrix, which on high macrosynthetic fiber mixes, requires a reduction of the coarse aggregate and an increase in the mortar fraction of the concrete. The three-dimensionally distributed fibers reduce the settlement of the aggregates and cement and the rise of free water to the surface of the slab as bleedwater. The actual workability will be dependent on adjustments in the conventional ingredients to accommodate the additional surface area introduced by the fibers. A trial mix, either in the laboratory or in the field, is recommended to identify any modifications required in the proportions and to provide experience in finishing the mix. A consideration of changes desired in the mix design to achieve the desired workability should also include consideration of HRWR. Use of additional water to achieve the desired workability is not a consideration, as this will negatively affect the compressive and flexural strengths. ABC Polymer’s Professional Engineers are available to assist in adjusting the mix proportions of any FRC or FRS mix design. STRIKE OFF: For FRC slabs-on-ground, the use of a vibrating screed or laser screed is highly recommended. The vibrating action of this equipment helps to consolidate the concrete as well as bring the paste to the surface of the slab, which enhances finishing. BULL FLOATING: Magnesium floats are recommended to create a smooth, level surface and close any tears or open areas that occur during the strike off. Do not overwork the surface when finishing, as it will bring unwarranted fibers to the surface. BLEEDWATER: Bleeding is a form of segregation, where some of the water in the concrete rise to the surface when it is freshly placed. Fiber reinforced concrete tend to bleed less, more evenly, and slower than plain concrete. Reducing the bleeding will lead to fewer and smaller bleed channels, which reduces the potential for unwanted chemicals getting into the concrete. Reducing the bleeding will also create a more uniform concrete from top to bottom, resulting in a denser and stronger slab surface. As with plain concrete, wait until the bleedwater has evaporated and a finisher’s footprint leaves a 1/4” deep impression or less before finishing the concrete any further. MACHINE TROWELING: Will produce a smooth, uniform finish with little to no fiber exposure when the mix design proportions have been appropriately addressed for the fiber dosage rate. FINISHING: Both synthetic and steel fibers are consistent with most finishes and surface treatments. Burlap Drags: Burlap drags are NOT RECOMMENDED for fiber reinforced concrete as they may lift the fibers and tear the surface. Rake and Broom Finishing: Brooming and raking are best accomplished by pulling the broom or rake in only one direction (east to west or west to east). A stiff bristled broom is recommended. There may be some fibers at the surface, but there is no cause for alarm. Synthetic fibers will wear away in a short time with normal traffic. NEVER use a torch to remove synthetic fibers, as it will shock the concrete. Steel fibers can be removed by clipping the fiber from the surface with offset nippers or wire cutters. These steps are rarely necessary with experienced fiber-reinforced concrete finishers. SAW CUTTING: The final step in finishing fiber reinforced concrete is proper jointing and curing, following ACI Guidelines. • Wet saw cut joints should be cut to a depth of 1/3 of the slab thickness or a minimum of 1 inch (25 mm). This must be done within 12 hours of placing the concrete. • Soft-Cut or cut the joints immediately after finishing the concrete. It is recommended to start with a trial cut to evaluate for aggregate spalling and fiber raveling before the concrete is cut any further. If aggregate spalling and/or fiber raveling does occur, the operator should stop cutting and resume 20 minutes later. The trial and evaluation process may be repeated several times, depending on the conditions, concrete temperature, and curing environment. For detailed instructions, please contact Bobby Zellers at rzellers@abcfibers.com or Rob Yates at rob@abcfibers.com. ACI Committee 544, Guide for Specifying, Proportioning, Mixing, Placing and Finishing Steel Fiber Reinforced Concrete, ACI 544.3R93, American Concrete Institute, Farmington Hills, MI., 1993. M. Harding, “Mixing, Placing, and Finishing Fiber Reinforced Concrete”, Concrete Construction.